Haven't use it yet but looks good. Keep kitchen knives like new with this ceramic, tungsten, and diamond professional knife sharpener. 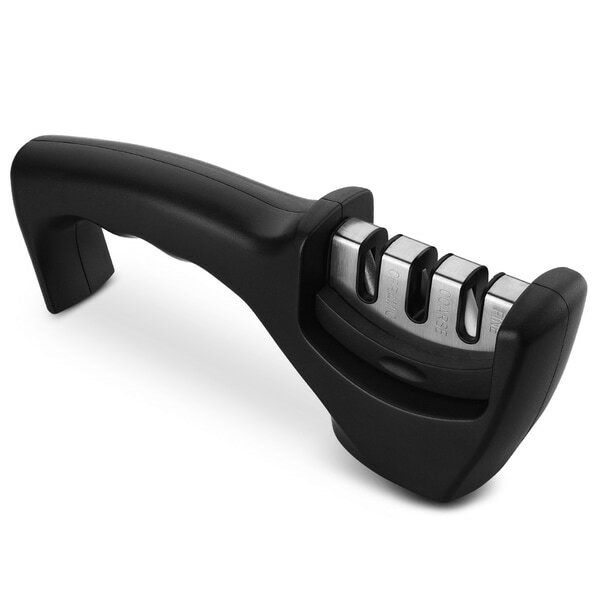 Designed for use with ceramic and steel knives, this black, heavy-duty sharpener keeps blades razor-edged to reduce the risk of cuts and make kitchen tasks easier. I collect knives and own two dozen of them. Before I bought this sharpener I was using a cheap sharpener that my wife owns and had used for her Kitchen knives. It worked 'OK' but I could never get a consistent sharpness. The day I received this one I sat down and sharpened all my knives, every last one of them. They are now Sharp for the first time! This sharpener is well made, easy to use and really works! For the price it's a real bargain and I would recommend it to anyone that loves their knives as much as I do.And as a favor I sharpened my wife's Kitchen knives also-she threw her sharpener away and now I keep them sharp for her. Five Stars! Black Ceramic/Tungsten/Diamond 3-stage Professional Knife Sharpener for Ceramic and Steel Knives Works well, and is a good price. Nice and sturdy. Easy handle to hold. Wanted a nicer one than I had. Have not used it just yet so cannot say but will update . Love that it has a ceramic knife slot . Purchased one for my Mother who has quite a few ceramic knives....she'll love this. Current review: This sharpener works excellent. Sharpened scissors, knives and ceramic knives and it deleted veered. Would recommend. No cons here. Just got this today, so no opinion on performance, but fairly sure it will meet my needs. Box that knife sharpener is in was flattened during shipping as it was just dropped into a plastic shipping bag and mailed. Sharpener stood up to punishment seemingly okay. What got me really excited was when I discovered you can rotate the center portion that has the sharpeners. So, fellow lefties we can pull out the center portion, rotate it and reinsert it! That way the handle is on the right allowing left hand to be used to sharpen. I realize that may not seem like much to you but after 50 plus years I rarely see items for lefties. I followed the instructions for this knife sharpener and used it on my steel knives. The instructions said to run the knife through the sharpener 3 times and to try a paper test to check its sharpness. I obviously had very dull knives and had to run them through the sharpener at least 10-12 times before I could pass the paper test. So, this product does work, but if you have really dull knives or if cooking is your profession it might be better to have your knives professionally sharpened. I thought it was a larger knife sharpener. It is okay but I would have rather had a knife sharpener that was electrical. It seem to sharpen my kniives okay. This manual knife sharpener takes longer to sharpen your knifes. I will invest into buying a electrical kniives sharpener. I don't have that much time to be trying to take a long time in sharpening my knives. I wish this kniives sharpener the handle part of it comes in the color Aqua and the knife is silver. I like my Utensils to match my color scheme in my kitchen. I hope that this company will make a knife sharpener that comes in different colors. Love this sharpener! I gave my previous sharpener to a friend so I was looking to replace it. I settled on this one after searching for months. It's very stable when holding it on the counter and rests comfortably in your hand. Sharpening is simple and straight forward with no fumbling around. The sharpening wedge pops out for easy cleaning. I spent the next hour sharpening every knife in the house! Highly recommended. I already have one. This is a gift for a friend. I love my knife sharpener and a friend that likes to cook told me she doesn't have one. I hope she likes it! Other sharpeners have failed me miserably over the years. My sister recommended this and said she swears by it to keep her knives sharp! She was right, I spent the evening sharpening every knife in the kitchen! I love the ergonomic style of it and the fact that it's s lightweight. I would definitely recommend this product! This is a great tool to have. I've used this to sharpen my favorite knives which brought them back almost like new again. I like the sturdy handle and size. Great and easy to use. Has three different sharpeners to keep my knives in excellent use. It sharpens our cheap knives ok, but I still had to use a sharpening stone on the chef knives. It is a bit bulkier than we thought, but I usually don't get out my ruler to see what it would be like, that's on me. This product was exactly what i needed. I was tired of using the stone age knive sharpener that was heavy and long. I recommend this to all those beautiful ladies that want to get their knives sharpened , but do not want to make too much force with their precious hands. This is light and works perfectly.